Alnico magnets, by their nature, are easy to degauss (demagnetize) with drive. They will not change with time and their dependence on temperature is really small – maybe 1% at 100 degrees Fahrenheit. Alnico stability and resistance to back EMF is really good. This is why they make very good sounding magnetic structures. Unfortunately, given a big enough pulse of magnetic energy, they will degauss by up to 3 dB. The sensitivity to degaussing is dependent on the specifics of the magnetic circuit and the length of the coil providing the field. Underhung woofers, midranges, tweeters, and compression drivers do not have sufficient back EMF fields to push the operating point of the structure below the knee. They are essentially stable regardless of input signal. The short-gap, long-coil speakers are the ones that have a problem. A woofer can take a hit of up to 3 dB, if a big enough hit of current takes place. 1.5 dB to 2 dB is more common. The effect does not get better or worse with time, it solely depends on how much current is driven through the coil. The more current, the more field. Once the field is bigger than a certain number, some amount of degaussing occurs. It is permanent (until externally recharged) and will only increase if a larger sustained current hit occurs. Therefore, if you have a qualifying alnico woofer and you have played it loudly, you have some degaussing. You can have the unit recharged, and it will be fine until you play it again. Exceed the critical level, and it will start degaussing again. If you never do, it won’t ever degauss. Most of these designs trace back to the 50’s and 60’s where 15 – 30 watt tube amps were the rule. They didn’t have the current capability to hurt anything. With the advent of big solid state amps, the current levels went up and the problem started to surface. Most of the qualifying motors will lose 1 – 1.5 dB, unless they are pummeled. Some of the older 3″ motors with really short magnets will typically be around -3 dB down. They go really easily. 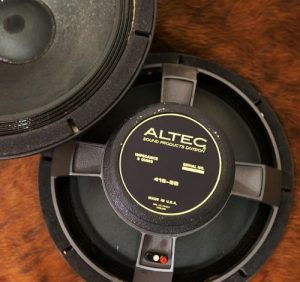 Great Plains Audio can regauss your alnico magnets, if they need it. Regaussing is included free when we replace diaphragms and cones.